Each year, I find that I have such a huge divide in my classroom as far as mastering 5th grade math skills: students who get it and could teach it, students who could get it from some quality (and sometimes additional) instruction, and students that need major intervention and cannot focus during whole group because of attention or because of gaps in knowledge and understanding. Doing small group instruction + guided math centers 2-3x a week has really helped me provide the kind of instruction that ALL of my students need. This post will share a peek into what my guided math rotations/centers look like in 5th grade with several free math centers. (Also, make sure you check out the huge lists of additional blog posts to check out at the end of this post). I start each Guided Math lesson with a 15-20 minute mini-lesson. 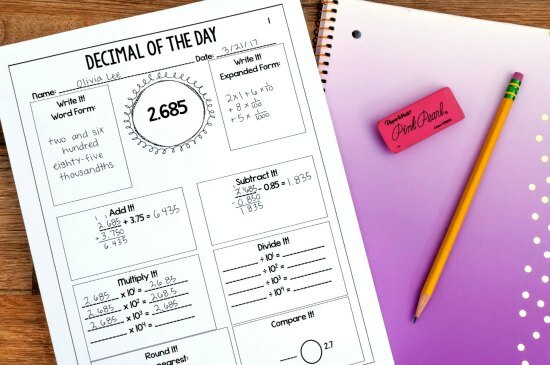 This mini-lesson is typically reviewing or extending the skill(s) the students will be working on that day during all or some of their centers. After the mini-lesson, I quickly go over the center requirements for the day. I am able to quickly go over the requirements because I keep my math centers very consistent. I want the focus of our guided math time to be the math they are doing and not learning a new game or center each week. For Teacher Time, the students come to my back table where I teach a very focused lesson on a new skill, reteach an old skill, or extend a skill. Here are some of the materials I use. My Differentiated Math kills Sheets allow me to focus on specific skills at different levels. I can work on the same skill with each of my groups but at their level. The best part about these sheet is that each level is 100% different from the previous and next level (three levels in all) so my lower group can progress through each level. 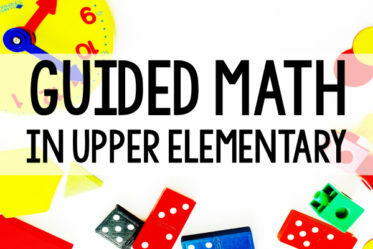 Click on your grade level to grab FREE samples of these guided math differentiated skills sheets to try out. Teacher time is the perfect opportunity to focus on word problems and math tasks that are rigorous and on grade-level. You can provide the necessary scaffolding and support while the students are working with you. You can vary the support as needed, depending on your groups. If you could like to purchase constructed response tasks aligned to the common core standards, click on your grade level below. 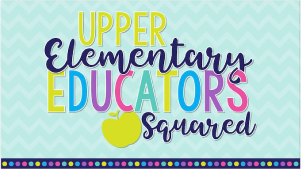 Just as the name of the center indicates, this center is all about putting that pencil to the paper and practicing math skills. 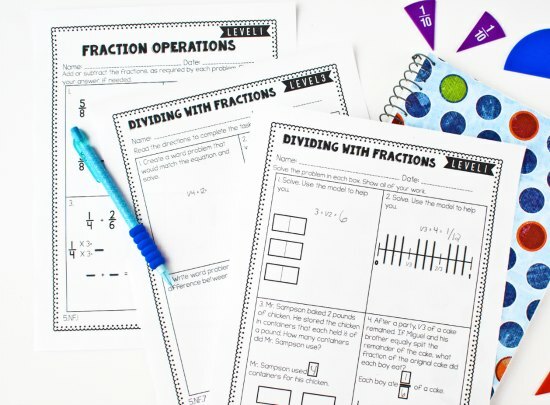 I do try to make it more engaging than just regular worksheets by having my students complete Mini Math Review Booklets , Error Analysis Tasks or one of my “Of the Day Printables”. The mini-review booklets are a huge hit with my students. They love the novelty of them and I love how many skills they can review. Each page of the booklet focuses on a different skill and only has about 4-6 practice problems. This is the perfect amount to review without overdoing it. I can also use these math booklets to see who needs re-teaching on specific skills. The students bring their math booklets to the Teacher Time center as well. Sometimes I use the math booklets to complete individual math conferences with students during Teacher Time. 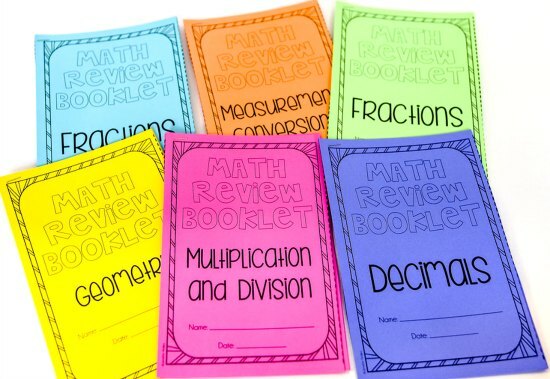 Click here to see the Math Review Booklets in my TpT store. 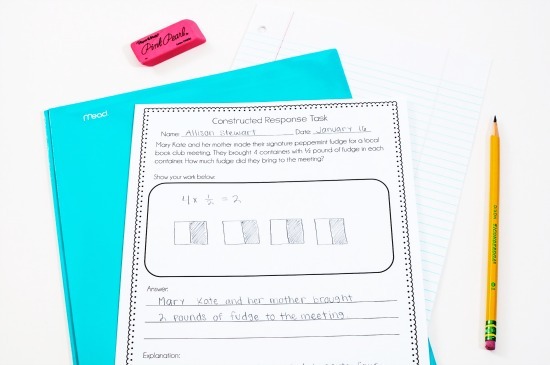 Error analysis math tasks have always been a huge hit with my students. These are also perfect to place in a paper and pencil center. I usually place 2-3 printables in the center and that is plenty to keep them busy during our 20 minute rotations. 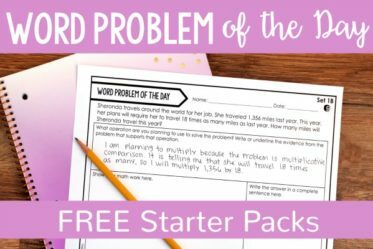 Click here to grab NINE free math error analysis tasks for 3rd-5th grade. 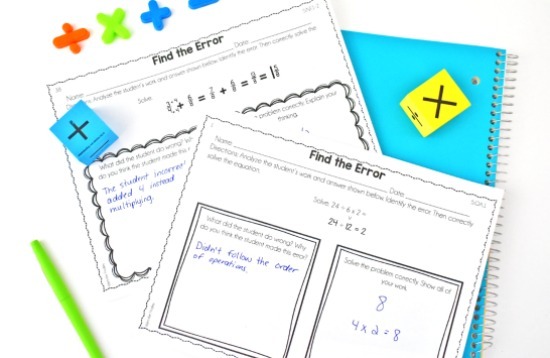 To purchase full sets of Error Analysis Math Tasks, click here to see them in my store. 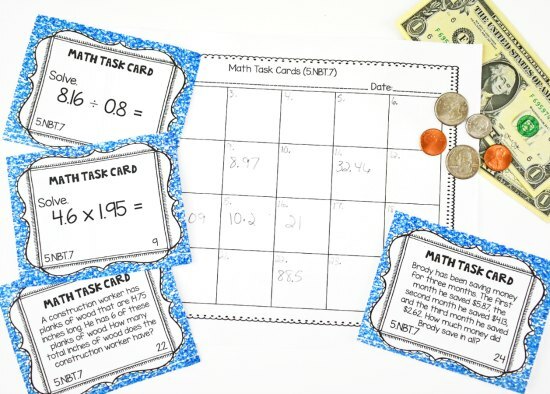 My “Of the Day” Printables are perfect for guided math centers (or math warm-ups) because of the consistent format of the printables. Since guided math centers are so short (20 minutes each), the focus of the students’ work time really needs to be on the math. The consistent format of these allow for that- and believe it or not, the students really enjoy completing these. The consistency provides a scaffold and confidence boost for struggling students. This center is always one of my Roll and Answer Math Centers. The skill changes out weekly or even daily depending on the week. However, the directions are always the same. 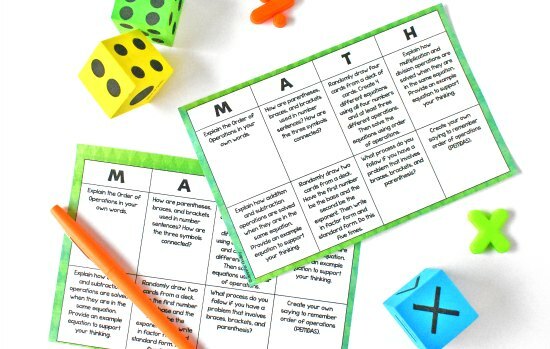 This allows the students to focus on the math involved and not learning a new game or trying to play a complicated game. To read moare about my roll and answer games click here. 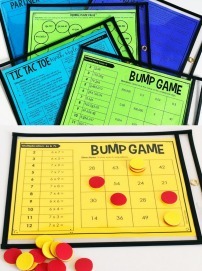 Because I have 3rd-5th grade games made, I can easily differentiate the games as needed. They are self checking, so the students are able to monitor their learning. 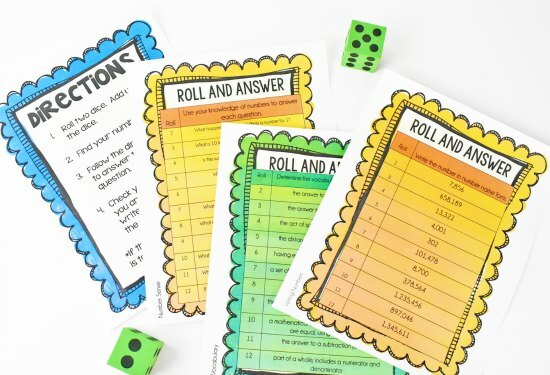 Click here to grab some FREE roll and answer games to try out! This center is where the students work on the skill I taught at teacher time or a previously learned skill via Math Task Cards. The task cards are also self checking, so the students can check their answers and correct them as needed. 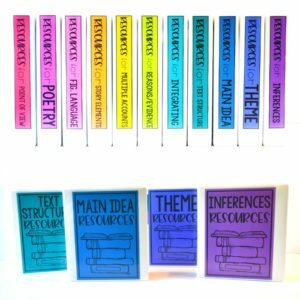 I have bundled sets available for 4th grade (click here) and 5th grade (click here) so you can have a task card set for each standard that you teach. This will allow you to keep your task card center consistent throughout the year. Vmathlive (paid subscription from the school): The students work through math tasks I assign them and at their own pace. Xtramth: The students practice their math facts, again at their own pace. Ipad App: Splashmath (paid app): We have a few tablets also, so usually half of the students are at the desktop computers (we are not 1:1) and the others are on the tablets “playing” Splashmath, which they love!1. I do like to keep my centers very consistent but I like to add in a new engaging math center. I typically call this a wild card center but it could also be called Teacher Choice. For this math center, my students complete math centers that don’t fit into the other math center types above. These typically come from my Standards Based Math Center Bundle. 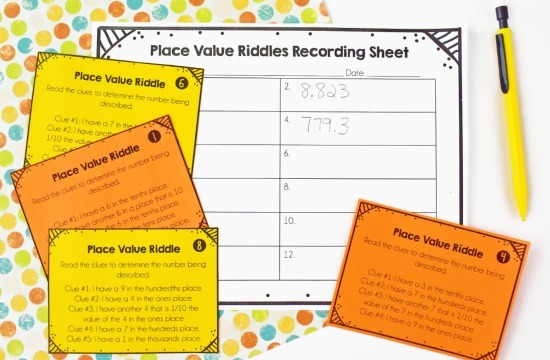 These can be math puzzles, spinner centers, mad lib style word problems, etc. I typically don’t have to worry about this because the math centers and activities include more than enough work to keep them busy. However, I do use math choice boards for those occasional early finishers. The math choice boards allow the students to choose how they want to practice a skill/standard and they really respond well to that. 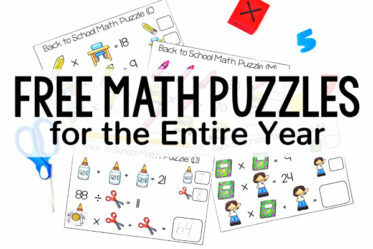 Click here to grab some FREE math choice boards to try out! Click here to see the full sets of math choice boards (available for grades 3-5). Since I teach 5th grade, I don’t use any kind of board or workstation chart. Instead, I organize the centers in clockwise fashion around the room to make it super easy to transition. The students learned the rotation after just two days. We only do rotations twice a week (sometimes three – but that is usually choice centers), the students rotate through the six math centers in those two days. They do three one day and three the next. I *always* meet with my two lower groups first, with my lowest group being the very first one I meet with. That way I can provide them immediate instruction before they begin working independently. Also, I sometimes will start the paper and pencil center with them to get them started. And I will 90% of the time give them a differentiated 4th grade roll and answer game. 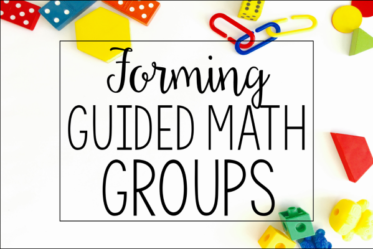 Click here to read more tips about how I support my students with math centers. 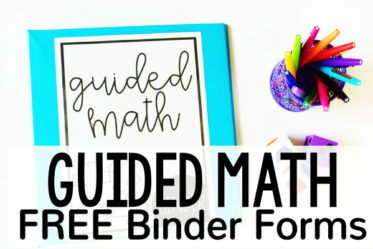 Love guided math! How much time is your math block? I use 3 rotations due to time. Emily, I have a 90 minute block. I have used three rotations in the past, but this year I have a larger class size and some with such huge gaps, so I have four groups. I want to try this! I have such a big divide in my classroom and since it is my 1st year in 6th I did not know what to do to help those who really get it be more challenged and those who need help get the time they need with me. This may be something I try after break….I am a little scared! 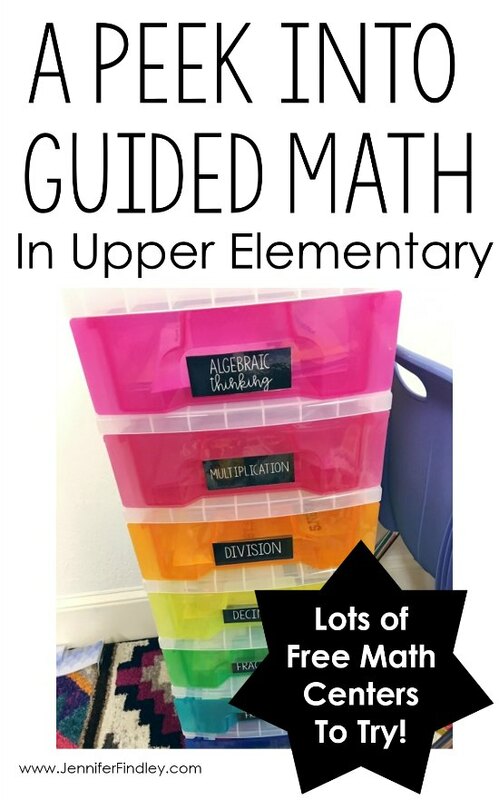 Thanks for posting this…I have a large divide of skills and levels of mathematical knowledge in my classroom and this would really be helpful. My only fear is that what I do when one group is ready to move and I have groups who are still working on certain standards they need to be done with. How does that look in your room? Do you need to meet with your lower groups for longer periods of time each of the three days and your high flyers a shorter amount of time? That is what I do in reading groups and that works well, but I don't meet with each group each day! Help me 🙂 I would really like to do something like this and MAKE IT WORK!! I do teach different standards to different groups as needed. I will re-teach skills to my lower groups and use a lot of higher order problem solving tasks with my higher groups. And yes, it does work out to where my lower groups get a longer amount of time each day (30 mins for the lower groups, and 15 mins for the higher groups). I see you have a 90 minute block, but how long do you run each of your groups? I usually have my two lower groups for 30 minutes each and then my two higher groups for only 15 minutes each. Are students given a certain amount of time to work through each center activity or do they just move on to the next center as they finish each center? I teach 4 classes and each class is about 75 minutes long. I am trying to figure out how to make this work for next year. 1. Mini lesson to build background or review conceptual understanding that is needed. 2. Pose a problem to explore. Discuss and solve the problem whole group. 3. Solve similar problems whole group. 4. I send the students who are ready for independent work back to their seats and keep the strugglers at the carpet to work on more guided practice. 5. Close the lesson with an exit slip to check understanding. Jennifer – thanks for you information. 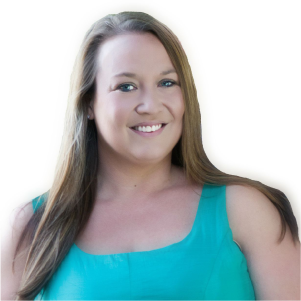 It sounds like your kiddos are successful and this model really works. We are really focusing on math and I need some fresh ideas. Can you map out what your week looks like so I can gage what I might be doing on a daily basis. Specifically: do you do a whole group lesson on one day? Are there centers on that day? You said you do 4 rotations each day, does that mean you have several things for the students to choose from since it seems they will hit each rotation a few times in the week? How are you grading/assessing? Thanks again! Hello! Would you mind telling me the flow of your week? Do you do the mini-lesson and then stations, followed by a new concept? Love the idea, but it should be spelled “peek”. Peak is like the top of a mountain. Carol, thank you so much for kindly letting me know about this error. I updated this image last month and in my haste made that ridiculous error. Thanks again! 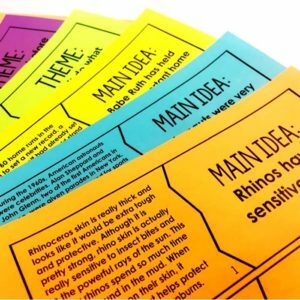 I’m new to teaching fourth grade this year, and I’ve found your blog and resources extremely helpful. Thank you! One thing that I’m still tweaking and struggling with is my visual for displaying the groups/centers/rotations for math centers. Have you found a way that works for you? Thank you again for sharing your insights and knowledge! Could you please give me a list of essential math manipulative you use in your centers so I can put them on my school order. Sorry so late, Joanna, but here are the math manipulatives I use in 5th. Thanks so much for this post! I’m a second year fifth grade teacher. 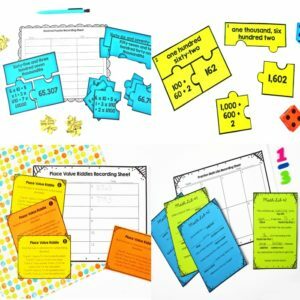 I used math centers very similar to yours almost exclusively during my first year and it was amazing! The kids loved math, I had 0 classroom management issues during center time, and our test scores were awesome. This year, I’m at a new school that requires all teachers to level their students into below, on, and above grade level groups. We then switch around our students into homogenous math classes. I teach the below-level kiddos. We tried math centers for a few math concepts and it was a disaster. Many of the kids were off-task or totally lost; I ended up stopping centers for the entire class. I’ve been SERIOUSLY missing math centers, and I can tell my students are bored with our math lesson format (review homework/exit ticket from yesterday, mini-lesson, interactive notes/guided practice, independent practice, exit ticket). 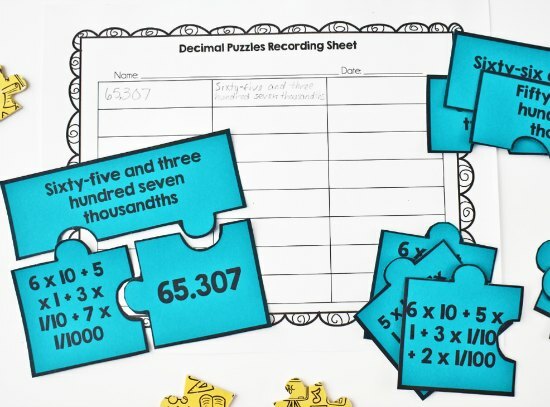 Do you have any suggestions for making math centers work in a below-level class? I’m struggling to find my footing with math centers in this environment. I KNOW they would benefit from centers, but I’m not sure what adjustments to make! I would love to try the rotations. Do you have any problems with noise level especially the games? Hi Dinh, I don’t at all but we do have discussions about noise level and keeping it at an acceptable level. Thank you so much! This gives me a much clearer picture on how I need to implement my centers! I’ve always wanted to do this but wasn’t quite sure how to implement the skill! Do you still have these in your TPT store? I would love to look at them and purchase some but when I click on a link they do not show up. Hi Brooke, I checked all the links and they appear to be working on my end. Which resource are you specifically asking about? I can help you better that way. Thanks! It could very well be on my end and my java or adobe not allowing the pictures to show up. I am interested in looking at all of them actually. I am currently teaching 5th grade, but may be moving to 4th next year. I just wanted to see what they looked like to see if they would be a good fit for my class. Hopefully, those will work. Let me know if you have questions about any of them! Let me know what questions you have after checking out the post above! I think it will help you get started! I have been doing a lot of research on implementing a math workshop model, and I’m really excited about trying it! I’m struggling, though, on how to organize it when I have only an hour for math, and I teach Everyday Math. Is there any hope for actually implementing it well, or should I just give up? I looked at the lessons for the week (we had strict pacing from our county) and I scheduled the meaty lessons for whole group days. Then the other lessons were workshop days. I only typically did centers 2 times a week. This post is a great break down of what I did each day and how I made it work. That above blog post is full of information and lots of details. Let me know what questions you have after reading it. Thanks! I love your site. I may be confusing yours with another – but did you have a part that talked about how you rolled out the first 2 weeks of your centers? I have struggled with mini-lesson concepts. I have tones of centers and am able to hold center rotations but I can not seem to help a small group in 20 minutes or hold whole group mini lessons. I usually end up taking 40 to 45 minutes. Its a struggle. I would love to look at your resources, but your links don’t connect to anything on you TPT store. Are they gone? I would love to look at your resources, but your links don’t connect to anything on your TPT store. Are they gone? Love these work stations. Question though. How do you incorporate vocabulary and fluency? My students lack understanding of vocabulary at a 5th grade level. Also, they are weak in fluency. I wanted to somehow incorporate both in a workstation, but I have very little time. Hi Debbie, vocabulary is embedded in the stations. 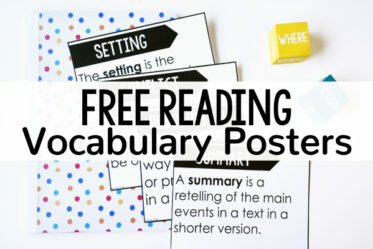 I might add in a few questions specifically for vocabulary in a center if my students need it. For fluency, it varies from class to class. One year, 95% of my students lacked basic multiplication facts, so I actually had to devote 15 minutes of my math class to this. We went to the computer lab Mon-Thurs and did Extra Math. I assessed them weekly based a their pace, to hold them accountable. I also taught them strategies to finding the answer to a multiplication problem if they didn’t know it for a 5th grade level problem. What is not included in this post is that I also added a technology center with desktops and ipads. When I have only clusters of students who do not have math fact fluency, they work on it at the technology center. Do you have a planning template you use to help you organize? I’m 4th, but definitely wanting to adapt your ideas to fit my kids! We have extremely fast pacing (units are 1-3 weeks) and I’ll be one of the inclusion teachers for our grade level. I’ll have a resource teacher come in every day, so I’m hoping that will help! How do you “Of the Day” problems work? What do you do if a student finishes the first problem and wants to move on to the rest of the problems? Hey Jennifer! I currently teach 5th grade math using the guided math center model. I have 1 or two days that are whole group instruction like you do. I’m interested to know what you have your students work on during the independent practice portion of the lesson while you are pulling on the spot groups. This seems to be the hardest thing for me to pull together each week. Thanks so much for all of your help! I love this idea and would like to incorporate the centers into my 5th grade classroom. However, since our 5th grade is departmentalized I only have about 55 minutes with each class. How can I modify the day to make it work for that time frame? I’m wondering how exactly your room is set up for your centers? Do the materials stay in the various locations permanently or do your students go get the materials from a certain location and then go to the location for centers? You said you don’t have a board or anything for centers but I think my class needs it/I need it, any recommendations for both setup of room/scheduling. I have a 60 minute math block with one day a week of 90 minutes and my room is pretty small.